Warriers fans will love this Golden State Warriors NBA Fleece fabric. It's extremely popular for making tie blankets, as well as hats, scarves, and pillows. Fun print on cozy fleece fabric. Exactly what I was looking for at a great price!! Big Warriors’ fan! Great for scarves. After shopping several websites for this material, Online Fabric Store had the lowest price for the same fabric at other stores. 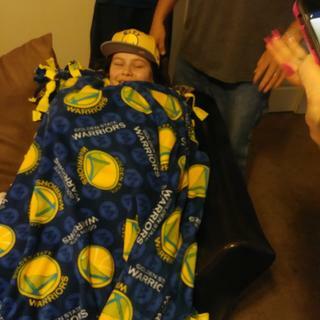 Granddaughter dates Golden State Warriors player,I'm making her a fleece blanket for Xmas. Do you have the coordinating solid blue fleece for the warriors? When do you expect the fleece to ship? Do you have Golden State warriors fabric in cotton or polyster? I am trying to make a table cloth. When will it be in? My shipping experience and product received was on point. Highly satisfied!!! Purchased this and gold to make my grandaughter a tie blanket. I was at first disappointed because the fleece seems a bit thin. But the price is good and it will be double layered so its going to be perfect. Also, my problem, I didn’t check out the image and the logo circles are smaller than i imagined, but also its fine the way it is. I loved how perfect my order is and how quickly it came with no extra packing! I will order from Online Fabric Store again.